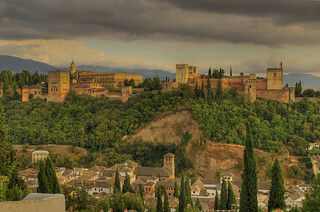 Vista de la Alhambra desde el mirador de San Nicolas / View of the Alhambra from the "Mirador de San Nicolas"
En 1238 entra en Granada por la Puerta de Elvira, y para ocupar el Palacio del Gallo del Viento, Mohamed-Ben-Nazar (o Nasr), llamado Al-Hamar el Rojo (ya que tenía la barba roja). Cuando Ben-Al-Hamar (Mohamed-Ben-Nazar) entró triunfador en Granada en ese año de 1238, la población le recibió con el grito de Bienvenido el vencedor por la gracia de Alá, él respondió: Solamente Alá vence. Éste es el lema del escudo nazarí y también está escrito por toda la Alhambra. Ben-Al-Hamar construyó el primer núcleo del palacio. Su hijo Mohamed II, que fue amigo de Alfonso X el Sabio, lo fortificó. El Comité del patrimonio mundial de la Unesco declaró la Alhambra y el Generalife de Granada como Patrimonio Cultural de la Humanidad en su sesión del día 2 de noviembre de 1984 y cinco años después, el barrio de El Albaicín (Al Albayzín), antigua ciudad medieval musulmana, obtuvo la misma denominación como extensión de la declaración como Patrimonio Cultural de la Humanidad de La Alhambra y el Generalife. La Alhambra fue uno de los 21 candidatos finalistas para ser elegida una de las Nuevas Siete Maravillas del Mundo, aunque finalmente no consiguió tal título. The Alhambra (Arabic: Al-Ħamrā, literally "the red one"), the complete form of which was Calat Alhambra (الْقَلْعَةُ ٱلْحَمْرَاءُ, Al-Qal'at al-Ħamrā, "the red fortress"), is a palace and fortress complex of the Moorish rulers of Granada in southern Spain (known as Al-Andalus when the fortress was constructed during the mid 14th century), occupying a hilly terrace on the southeastern border of the city of Granada. The literal translation of Alhambra, "red fortress", reflects the color of the red clay of the surroundings of which the fort is made. The buildings of the Alhambra were originally whitewashed; however, the buildings now seen today are reddish. The first reference to the Qal’at al Hamra was during the battles between the Arabs and the Muladies during the rule of the ‘Abdullah ibn Muhammad (r. 888-912). In one particularly fierce and bloody skirmish, the Muladies soundly defeated the Arabs, who were then forced to take shelter in a primitive red castle located in the province of Elvira, presently located in Granada. According to surviving documents from the era, the red castle was quite small, and its walls were not capable of deterring an army intent on conquering. The castle was then largely ignored until the eleventh century, when its ruins were renovated and rebuilt by Samuel ibn Naghrela, vizier to the King Bādīs of the Zirid Dynasty, in an attempt to preserve the small Jewish settlement also located on the Sabikah hill. However, evidence from Arab texts indicates that the fortress was easily penetrated and that the actual Alhambra that survives today was built during the Nasrid Dynasty. The design included plans for six palaces, five of which were grouped in the northeast quadrant forming a royal quarter, two circuit towers, and numerous bathhouses. During the reign of the Nasrid Dynasty, the Alhambra was transformed into a palatine city complete with an irrigation system composed of acequias for the gardens of the Generalife located outside the fortress. Previously, the old Alhambra structure had been dependent upon rainwater collected from a cistern and from what could be brought up from the Albaicín. The creation of the Sultan's Canal solidified the identity of the Alhambra as a palace-city rather than a defensive and ascetic structure. The Muslim rulers lost Granada and Alhambra in 1492 without the fortress itself being attacked when King Ferdinand II of Aragon and Queen Isabella of Castile took the surrounding region with an overwhelming force of numbers.